I'm a first time guinea pig owner. I've done a lot of reading on this site and others (like C&C cages, etc) and am hopefully on the right track. I wanted to write this to get feedback and to share my sick piggy experience. First off, I am going to confess to purchasing my pigs from a pet store. My experience only confirms what has been written about pet stores. That said, I am really glad that they have a home with me, and will hopefully be healthy soon. The two I have are not litter mates, and are about 8 and 10 weeks old, give or take a week. When they first came home with me, I noticed a very quiet and slight snuffly noise. Kind of like what one hears when they have congestion and are trying to breathe very quietly. There was no wheezing or coughing, but still, I suspected something might be up. This was later followed by tiny sneezes once or twice every hour or so. I started to worry. It had been about a week in, everyone was adjusting nicely and becoming friendly. Both were eating tons of hay and pellets, one was devouring vegetables, the other wasn't too sure about them yet. One morning while holding my younger shy guy, I had turned to look at something on the television. When I did this, he was startled, and started attempting to smell the air, and this is when I heard clear and definite wheezing. He sounded like he had some serious sniffles. I called the vet immediately and had them in two days later. During this time they were still eating well, playing, even pop-corning in their large C&C cage. Droppings are firm and shapely, the appropriate color, and quite numerous. There's no discharge from the eyes or nose. I took the harmful medications list with me. The vet was listed as an exotics vet. She seemed very knowledgeable when I met with her. The vet gave be Tribrissen (Bactrim). I took this home and gave them the medications per her instructions. This is where I made mistake number 1. I put the antibiotics in the fridge (because when I was a child, that's where my antibiotics went). Nowhere on the packaging does it say to refrigerate, and with a little research, I found that it is supposed to be stored at room temperature. I never thought to ask the vet about this, and realize now that I may have made the medicine less potent. My second mistake was giving the pigs medicine for one week. I couldn't remember what the vet had said exactly, and it wasn't printed on the label -- but we were pretty close to the end of the bottle and the vet had said she'd given me extra. So I gave them their medicine as instructed for a week and one day, then one week later I took them back to the vet for a post-treatment check-up. I had noticed the day before that the sneezing hadn't gone. The vet said that we should continue the antibiotics. I went home, realized I had enough to get me through the weekend, and today (Monday) I called to get a refill and ask more questions. I also did research about whether or not I should refrigerate the medication because I work late and don't have easy access to a fridge. THIS is the point that I discover that I should *never* have put it in the fridge to begin with. This weekend my piggies sounded very snuffely, but they were still playing and eating (though with a little less gusto than normal). I've been weighing them every other day or so and they have steadily been gaining weight. Still absolutely no drainage of the eyes or trouble eating or going potty. This evening I will start them on the room-temperature refill antibiotics. So that has been my sick piggy story. Lesson 1. Don't buy pigs from a pet store, but if you do, be prepared to take them to vet visits (cost be a pretty penny!). Lesson 2. Make sure you write down how long you are supposed to give the medicine, and ask about how the medication should be stored. 3. Made sure they are in a nice big cage with plenty of spots to hide and play, lots of timothy hay and oxbow organic cavy pellets, and fresh veggies every evening. 4. Give them lots of love, tidy their cage daily, clean weekly or twice weekly, and brush them with a soft toothbrush to keep them looking lovely. Any thoughts of what I could improve upon? Any more questions I should be asking? The only sign that I can tell of their URI has been the very tiny sneezes and a very slight snuffley/wheezing sound (which I still am not even sure is a wheezing). They wouldn't make the sound for my vet (I see what everyone is saying about them being great at hiding symptoms!). I really want to be a good guinea pig mom, and I did so much reading that I feel very bad that I didn't get the medication part right. :( Lesson learned! All my antibiotics go in the fridge. It won't hurt them. Even the bactrim. Bactrim won't work on all infections. It depends on the strain -- so you may need to have your vet switch to a different antibiotic to help clear this up. You should have started to see an improvement within a couple of days. What did the vet have to say at the follow up visit? Make the pet store pay your vet bills. Too bad you had to learn the hard way and could not rescue instead. Are you sure you have two girls though? Hope they are not pregnant. Yes! The vet double checked, they are both definitely male. There was improvement after the first few days, I think that I didn't continue the treatment long enough. She could not hear anything on the repeat visit, but said I should continue the antibiotics till they were gone, if I still noticed the symptoms, to call again. All the web searches I've done for Bactrim and it's other versions state very specifically that the medication needs to be stored at room temperature. "Answer:Not all liquid antibiotics need to be stored in the refrigerator. Refrigerating certain liquid antibiotics will actually break down the medication, making them ineffective. The opposite is true for certain other liquid antibiotics: They must be kept refrigerated. Be sure to read all the auxiliary labels on the medication bottle or the patient information sheet you receive. If the medication needs to be refrigerated, there should be a label telling you. If you are unsure, just ask your pharmacist. " Store Bactrim at room temperature, between 59 and 77 degrees F (15 and 25 degrees C). Store away from heat, moisture, and light. Keep in a tight, light-resistant container. Do not store in the bathroom. Keep Bactrim out of the reach of children and away from pets." Here's my plan: 1. Give them Bactrim as prescribed but NOT refrigerated, monitor health closely. If there is any decline, I can do one of two things. A. Take them back to the same vet, ask for a different medication, and/or B. Take them to another exotics vet and see what happens. 2. If I notice improvement, continue proper treatment for the indicated two weeks. Schedule a follow-up visit with the vet sometime shortly after two weeks from today. Obviously I don't know what I'm talking about. Sounds like you have a plan. I used to keep my Bactrim in the refrigerator too. Sounds like you have been reading. Weigh daily any time you think they're ill. I think it depends on how it is compounded sometimes? Hmm, probably what sus4rabbitsnpigs says -- And if you all have had good results with keeping it in the fridge that's important. I need to make sure that it's my mistake and NOT that the drug is ineffective on the strain of infection they have. Since you have all kept medications in the fridge, I will be extra sensitive about noticing changes and improvement so that I can have them switched to another drug if this one isn't working by Thursday morning (or if there is any decline before that point). Last night they were still stuffy. This morning my talkative pig (Burr) sounded rather hoarse and stuffy. This, plus the sneeze, is the only symptom right now. The wheezing/stuffy noise is only heard when they piggy is being vocal. They've gained a bit of weight since the vet visit on Friday, last night they ate very well (green leaf lettuce, hay, pellets). When I woke this morning they had eaten most of their pellets so I dumped the old and gave them fresh bowls. There was playing and hopping. My vet wasn't able to hear the sounds I'm hearing (as they are much more quiet and reserved around other people and strange places). So I'm wondering if the noises I hear and think are respiratory issues (sniffling/hoarse vocals/slight wheeze) are actually normal pig noises, or if it is better to err on the side of caution? Thanks everyone for the links and the advice and for sharing your experiences! Thanks to everyone here I've been watching them closely, and noticed that the wheezing and sneezing has gotten worse. Last night I called and made an apt. with my vet. She said chest x-rays were the next step. I came in, both were x-rayed, and we saw that the lung area was more 'grey' than it is supposed to be. She called a specialist (someone in the region who works almost exclusively with pigs and rabbits) to confirm and has now switched us to a small dose of Zeniquin per pig per day. I did a search of the forums and see that some other pigs have been on this or very similar drugs in the same family, so I am hoping for the best. Again, any thoughts or things I ought to consider would be appreciated. Thanks again! I'm glad you went back to the vet and got her to switch drugs. Hopefully you will see an improvement soon. I am noticing that Burr is a little stinky near his rear end. Poops are moist looking (when fresh) but firm and dark. I know I need to be on the look out for diarrhea. I'm giving leafy green veggies high in Vit C. -- should I also give a supplement daily? I looked at the dosage and I noticed it's much less than the C made for humans, so I am assuming I need to get supplements at the pet store. Does anyone have a link for exactly what I should buy? I don't have any healthy pigs to make poop soup out of, I read that some people sprinkle a bit of acidophilus capsule on a leaf and give it to them, but I'm nervous about giving them too much. Has anyone done this? Tomorrow I will search through the forums much more meticulously. 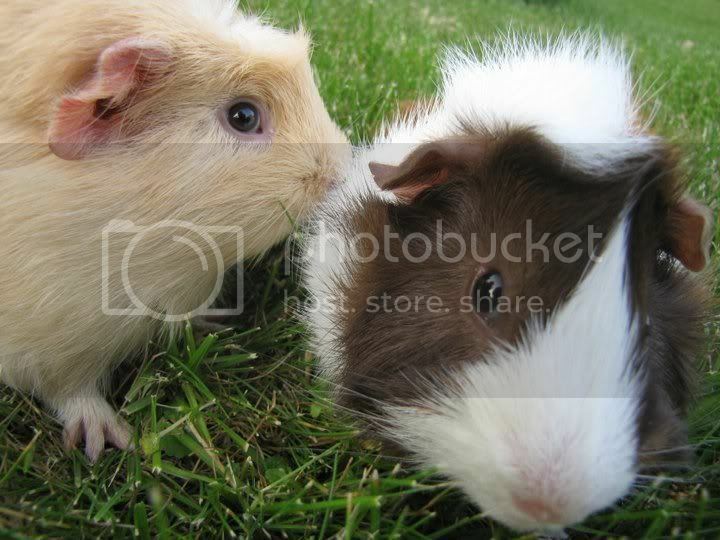 Also, on a unrelated note, do guinea pigs give kissies? Because Burr has gotten into the habit of giving me little licks (esp. after I stop stroking him for too long.) Maybe I am just tasty. Thank you thank you! A vitamin C supplement right now could help. Do read over gl/antibiotic_advice.html too. My current vet lists Guinea Pigs as animals that are served by the practice, but I am not terribly happy with the results. Also, her name isn't on the AEMV website (does that matter much?) and she isn't listed as an exotics specialist. This week, after being off ABs for one week, their URI symptoms have started to come back. the first round of antibiotics were given for too short a period, and then they weren't working at all when we tried them again at a slightly larger dosage for a longer dosing period (Bactrim). I think we tried it for 5 days with symptoms progressing rather than clearing up. After a re-check and some x-rays, I was given another medication (see previous posts) which DID work, and we seemed to be in the clear but for a few tiny dry sneezes here and there. The vet never gave me a definite answer as to how long to dose them for, plus they're young and growing rapidly, so the dosage from one week to the next should probably be different? We completed a little over two weeks, symptoms faded almost completely save for the occasional small dry sneeze. Now I have an appointment with a vet whose name is on the Association of Exotic Mammal Veterinarians list, and whose partner is recommended by the house rabbit society. In any case, when I called they said that both doctors had extensive experience with guinea pigs. I'll get them rechecked (had their records faxed over to the new vet this afternoon) on Wednesday. 2. Cleaning: Is vinegar and hot water the best substance for cleaning? Should I be bleaching water bottles? Recommended soap or no soap for washing containers? Should I be cleaning out water bottles more than once a day? 4. GL vets: Are there any well known GL forum users in SE Wisconsin that can recommend a vet? Worst case scenario, I can drive to the Chicagoland area, but I was very surprised that there's not a single listing on the GL vet page for WI. :( I'd LOVE to hear from another GP owner in my area regarding the best vet to go to. 5. We live in a basement apartment with air conditioning - should I be using an air filter or a dehumidifier? I keep the AC vent closed for the most part because it'll get cold if I don't, and I keep the windows shut most of the time to keep the humidity under control. I have a fan going throughout the night to circulate air. Anything I should consider here? I have allergies, and I sleep in this same room as the pigs. So far the symptoms are wet sneezes and congested sounding voices. They're learning to eat their C tablets. I supervise them through eating half a tablet nightly, plus their veggies. As an added note, I could just call my current vet and ask for a double dose of the last medication, do the whole routine again for two weeks and/or until the sneezing stops completely. I'm just a little disturbed by the number of vet visits it's taken to treat this -- is that normal for GPs? Should I expect 5+ visits to diagnose and treat something like a URI? If that's the case, maybe I am switching my vet too soon? What do you think? I'm sorry if I've missed something and seem terribly confused or am asking obvious questions. I think I've spent a lot of time reading and I may have over-researched and missed important things. I just want my boars to feel better! Thanks so much! Depending on what is wrong, some antibiotics are used for multiple weeks. UTIs, for example, can benefit from a longer course of treatment. Hopefully someone will share info on a good vet for you. I would not worry about housing. Normal cleaning should be okay. We visited the House Rabbit Society recommended exotics vet in my area, and for the most part it looked and sounded like she knew what she was doing (a big improvement over the previous vet) -- but I have some questions. 1. She prescribed Baytril for my pigs, who are 2 months old. I asked about the age, but she said that since this URI has been hard to completely get rid of, and the last drug they were on (zeniquil) breaks down to Baytril, it wouldn't be much of a change except we'll be dosing them for longer, and possibly adding Doxycycline for the last week or so of their treatment. We've tried Bactrim first with my first vet, and it wasn't helping. Should I be concerned about the Baytril since they are young, or is this the best thing since the URI has been so resistant? 2. She said that she believes the pigs have a combination of a bacterial infection AND a virus that was likely contracted from the breeder/petshop (boy have I ever learned my lesson, I promise) and related to bad genetics from poor early living conditions and over-breeding, etc, as is common with pet shop pigs. Do pigs get viruses? Does this sound off to anybody, or right on target? We went over their living environment in detail, she asked loads of questions. I asked her about moisture and temperature, etc. Seems like everything else is on target. She thoroughly inspected the boys. I've been making sure they get red pepper (high in vitamin C) with their regular veggie load, and have been working on getting them to take the Oxbow C supplement. I also have some Kleenmama hay & pellets on the way. Here's a photo I took last night (Dandelion is the creamy yellow one guy, and Burr is the sassy Abyssinian). More likely a bacterial infection than a virus but viruses are possible. Stress can be a factor in illnesses. *Both boars came home with URI symptoms when they were purchased (bad choice) in mid-April. *First round of Bactrim was given for a week, most symptoms trailed off. One week later, they were sneezing again. * Tried Bactrim again, symptoms got worse. * Switched to Zenequil, took this for two weeks. Symptoms came back. *Symptoms to date include regular coughing and sneezing. Small sneezes were noticed first, as the illness progressed, sneezes got larger and wetter. Coughing occured throughout the day regardless of meal time, both pigs coughed. *Changed vets (exotics specialist recommended by rabbit society with extensive GP experience) - got second opinion, are on the Baytril @ 3ml twice daily. 1. Both still sneezing. Less wet, but still fairly frequent. 2. Still no noticeable discharge or eye crust, etc. Only sneezing. 1. Burr & Dandelion both now happily eat their Oxbow Vit. C tablets. 2. They have been on Baytril for 2.5 weeks with no worsening of symptoms. Vet may add Doxycycline for the last week (we are on Baytril for one month says the vet. I was reading about Bordetella -- could this be possible with our symptoms? Has anyone else had a URI that just wouldn't leave? Is sneezing this frequently normal? It could be the abs need changing. The test for Bordetella is a simple one and wouldn't hurt to rule out. They probably don't have it but it's always nice to know what they don't have too. Are you giving a pro-biotic? As in humans, it's almost impossible to give too much. It sounds like you have tried some decent antibiotics. I would help you'd get results! What kind of bedding are they on? Is your environment at all dusty? I wash with vinegar and unscented detergent. I sweep it out daily AND I change out hand towels that sit under their hidey-houses. Hay is Oxbow & Kleenmama. We are in the basement (my large bedroom), the other room has cat boxes which are cleaned regularly. I do have to dust pretty frequently. Would an air filter help? Can you get free-standing air filters? Bugs Mom - I am wondering if not dosing them long enough on the last two medications has made them rather drug resistant? I think we'll be giving Doxycycline soon WITH the Bactrim. I will call my vet on Wednesday or Thursday and see if we need to do another medication. I am giving Acidophilus pro-biotic powder (from gel-cap) on moist veggies every evening after medicine. They get one Oxbow C tablet in the morning with medicine. I was giving them food in the AM too, but this made poops too moist. One thing my vet said was that the coughing (which has now stopped) was symptomatic of a lower lung infection (is this true?) and my LAST vet did x-rays, which showed their entire lungs being sort of gray (meaning that they might have been full of fluid or something?) Is this typical for a respiratory infection? Is there such a thing as a typical respiratory infection?